HÀ NỘI — While many handicraft villages in Hà Nội are still struggling to build a brand for themselves in the market economy, Vạn Phúc Village has found a way to preserve the traditional craft of silk weaving that has been the staple of the area for hundreds of years. Located about 10km west of downtown Hà Nội on the Nhuệ River, the village is well-known for the finest silk in Việt Nam. 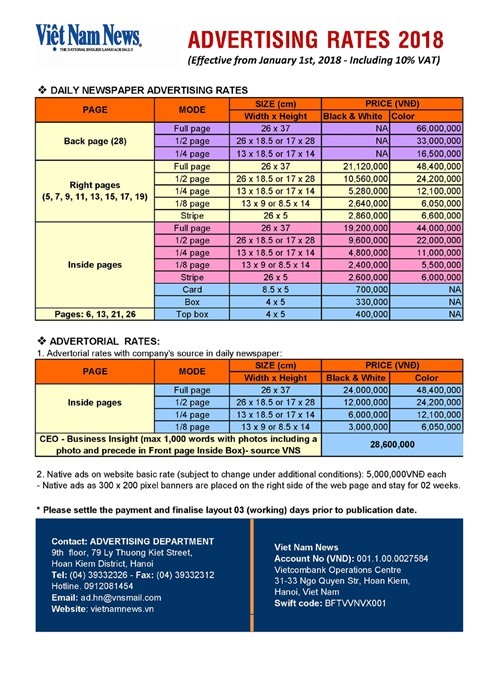 It has also become a popular destination for both domestic and foreign tourists thanks to its products and tourism promotions. 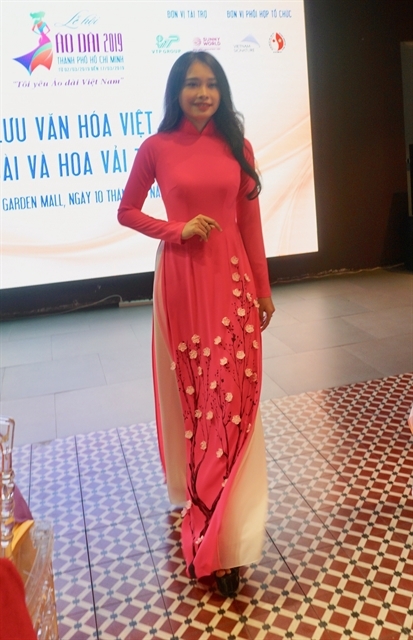 Vạn Phúc silk products include brocade, satin and chiffon. The most valuable of these is lụa vân, or silk cloth, with subtle designs weaved in the most sophisticated of styles. Based on traditional designs, workers in the village are creating more modern products to meet the increasing demands of domestic and foreign markets. Despite ups and downs, villagers are proud of their products, which have established a name for themselves in domestic and world markets, while making the village one of the top tourism attractions in the capital. 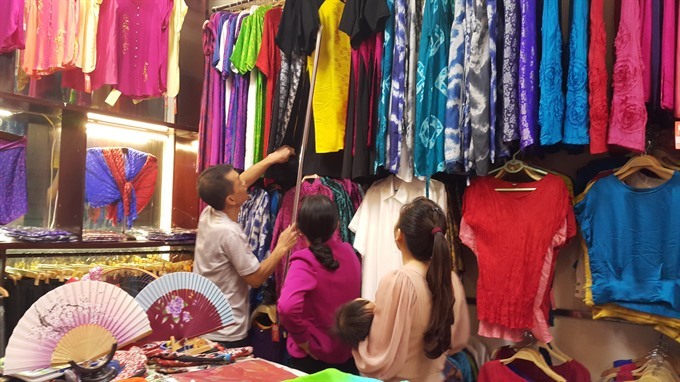 Customers who visit Vạn Phúc are attracted by high-quality silk products made by local villagers. Vạn Phúc has faced challenges preserving its traditional craft, especially with an influx of Chinese imports that made it difficult to differentiate between the original and the fake products. Some buyers searching for the genuine article were disappointed when they could only find Chinese fakes, leading to negative comments about the village. This led to a drop in the number of visitors until a programme was launched by local authorities to improve villagers’ awareness of their traditional craft by saying no to the sale of imported Chinese silk. Kiều Thanh Hải, vice-chairman of Vạn Phúc Ward’s Motherland Front, said local authorities started the project two years ago with a focus on encouraging local shops to sell Vạn Phúc products instead of imported goods. 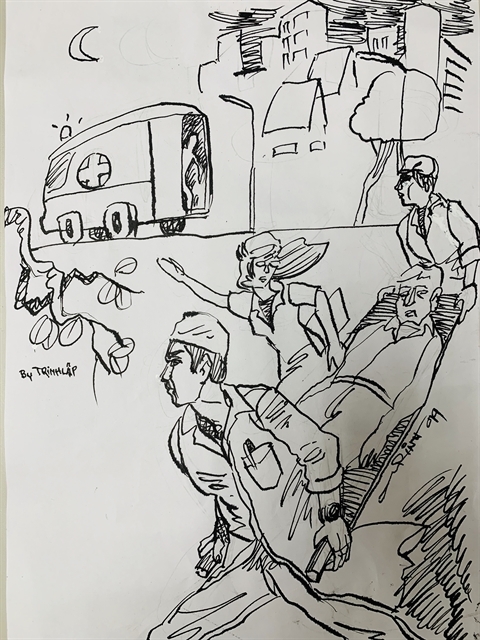 They set up inspection teams and warned locals that the sale of imported goods, particularly those from China, would destroy the village’s reputation. 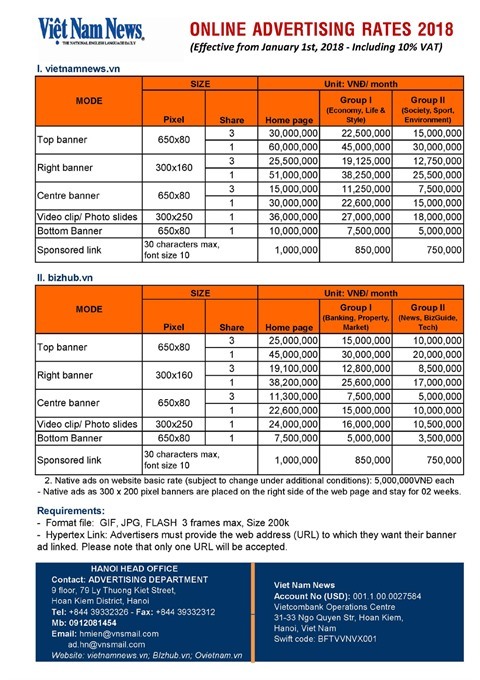 This led to a boost in sales of local products and a drop in Chinese silk, according to Hải. “Since the programme started two years ago, our inspection teams have not found any shops selling Chinese silk,” said the official. “Authorities have also asked shops that sell silk made in other provinces and cities to inform customers of where it is from,” Hải added. Vạn Phúc’s residents were now aware of the importance of preserving and promoting their traditional craft, according to Hải. 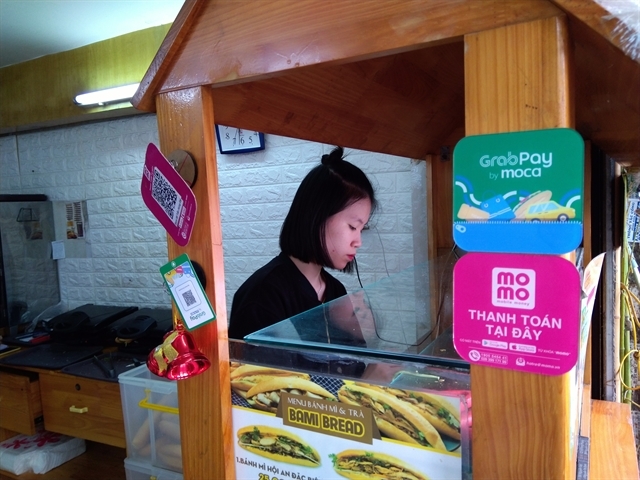 Đỗ Hiền Mai, a shopkeeper in Vạn Phúc, told Việt Nam News that the village now realised the importance of their products so they were working with authorities to promote the village trademark. 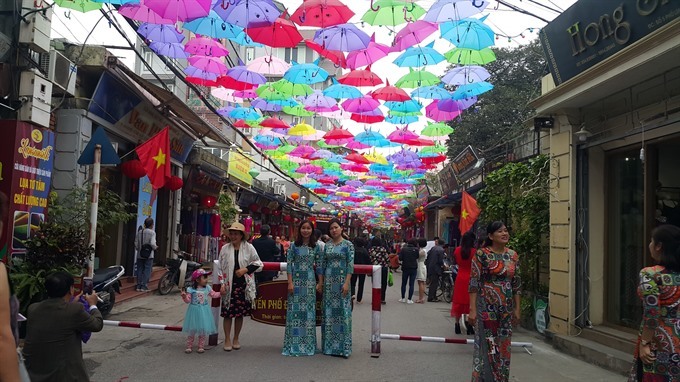 “More and more tourists are coming to Vạn Phúc to admire the essence and beauty of the village and its silk products. They can learn how the traditional craft is being restored and preserved instead of buying silk imported from other places,” said Mai. The number of households directly producing and selling silk products stands at about 145 and 160, respectively - a very modest figures compared to the 3,900 households in the village, but a high increase in production has been recorded. Annual production had reached about 2 million metres of silk fabric in the past few years but only enough to meet 60 per cent of local demand, so the remaining fabric was still imported, according to a local report. The village’s silk products were particularly popular during the Nguyễn Dynasty, which used them to dress the royal family and aristocrats. Not only prominent in the domestic market, the traditionally hand-woven and hand-dyed silk has captured the loyalty of customers outside the country. In 1931 and 1932, Vạn Phúc silk was displayed at international exhibitions for the first time in Marseille and then Paris. At the Paris Fair in 1932, the Vietnamese silk was praised by the French as the most sophisticated product to come out of Indochina. From 1958 to 1988, the silk was mostly exported to Eastern European markets. 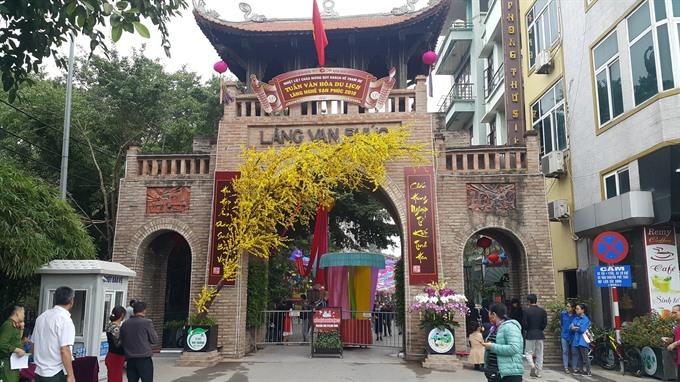 The main gate to Vạn Phúc during a culture, tourism and trade event held last week. A Vạn Phúc girl reels silk. With a history of more than 1,200 years, the village is proud to be the oldest silk weaving village in Việt Nam. It has been successful in combining handicraft preservation with tourism development and has become an amazing destination for craft village tourism. Restoring traditional craft villages is one of key tasks that Hà Nội plans to undertake, and Hà Đông District’s People’s Committee has formulated and implemented a project to restore and develop the craft village. 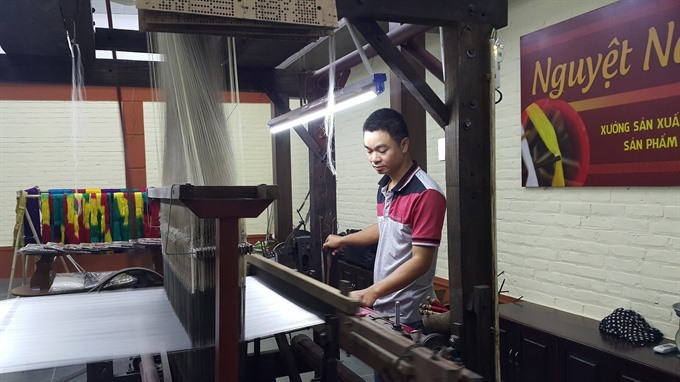 The village has organised tours for visitors to visit production facilities to explore the process of making the graceful silk cloth. 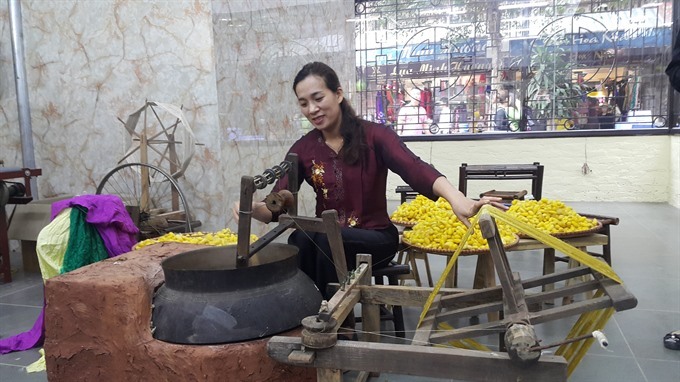 Visitors also have the chance to talk with artisans and learn about the history of the village, and enjoy the layout, architecture, ancient banyan trees, wells, communal houses and techniques used for making premium silk.